Following the recent release of The Barker Family Band EP, multi-platinum entertainer Sara Evans, along with daughter Olivia Barker (16) and son Avery Barker (19), have added additional shows to their limited engagement City Winery and SiriusXM Y2Kountry present Sara Evans and The Barker Family Band – Bloodline Tour. The trio has added a second show in Boston, for a total of seven shows over six days in May. In addition, California country act Fairground Saints have been added as special guests to open all shows of the Bloodline Tour. May 7 at 8pm	Washington, D.C.
Tickets are on-sale now at SaraEvans.com/Tour and guests can expect to hear mesmerizing harmonies on original songs and covers including Beyonce’s “XO,” – spinning on Radio Disney Country ‑ and Fleetwood Mac’s “Dreams” – spinning on SiriusXM’s Y2Kountry. The family focused project showcases Sara and Olivia trading-off lead vocals throughout the project while Avery plays acoustic and electric guitar on the tracks. The project is co-produced by Sara and Ben Fowler. Catch Sara Evans and The Barker Family Band on Emmy-nominated daytime talk show “Pickler & Ben” today, Tuesday, April 23rd. Trio to appear April 23 on “Pickler & Ben” ahead of limited-engagement tour kickoff May 7 in Washington D.C.
Nashville, TN — April 12, 2019 — Multi-platinum entertainer Sara Evans’s side-project, The Barker Family Band, with daughter Olivia Barker(16) and son Avery Barker(19), releases today via all digital partners at saraevans.co/TheBarkerFamilyBand. The 6-song EP offers a snapshot of this moment in time for the family and showcases mesmerizing harmonies on original songs and covers including Beyonce’s “XO,” – spinning on Radio Disney Country ‑ and Fleetwood Mac’s “Dreams” – spinning on SiriusXM’s Y2Kountry. Watch the People.com exclusive premiere of the “Dreams” lyric video HERE. The family focused project showcases Sara and Olivia trading-off lead vocals and harmonies throughout the project while Avery played acoustic and electric guitar on the tracks. The project is co-produced by Sara and Ben Fowler. Sara, along with Olivia and Avery, will embark on the limited engagement acoustic tour — City Winery and SiriusXM Y2Kountry present Sara Evans and The Barker Family Band – Bloodline Tour —launching May 7 in Washington, D.C. with six shows at City Winery locations throughout the month of May. Tickets are on-sale now at SaraEvans.com/Tour. The Academy of Country Music® announced today that Luke Bryan, Old Dominion, Blake Shelton and Keith Urban have been added to the exciting lineup of live performances for the 54TH ACADEMY OF COUNTRY MUSIC AWARDS™ and will be joined by a star-studded list presenters including Lauren Alaina, Beth Behrs, Clint Black, Nikolaj Coster-Waldau, Jessie James Decker, Hunter Hayes, Jay Hernandez, Lady Antebellum, Midland, Nancy O’Dell, Danica Patrick, Dennis Quaid, Wilmer Valderrama and more to be announced in the coming days. The awards telecast, hosted by Reba McEntire, will air LIVE from the MGM Grand Garden Arena in Las Vegas on Sunday, April 7, 2019 at 8:00 PM ET / delayed PT on the CBS Television Network. Multi-platinum entertainer Sara Evans’ side-project, The Barker Family Band, with daughter Olivia Barker(16) and son Avery Barker(19), is now available for pre-order at saraevans.co/TheBarkerFamilyBand. The 6-song EP, releasing April 12, offers a snapshot of this moment in time for the family and showcases mesmerizing harmonies on original songs and covers including Beyonce’s “XO,” premiering exclusively via Billboard, and “Dreams” (Fleetwood Mac). Hear “Dreams” now on your favorite streaming platform and get an immediate download when you pre-orderThe Barker Family Band EP at saraevans.co/TheBarkerFamilyBand. In addition, a limited number of CD bundles are available at SaraEvans.com. Priced at $29 the package will include an autographed CD copy of the EP along with an 8x10 photo and Barker Family Band t-shirt. Nashville, TN — March 8, 2019 — Multi-Platinum entertainer Sara Evans got her start in music at the age of 5, leading The Evans Family Band with two of her siblings. Her solo career took off after signing with RCA Records, going on to score five #1 singles, including “Born To Fly” and “A Little Bit Stronger,” selling millions of records and taking home trophies from the Academy of Country Music and Country Music Association. Family has remained a constant since day one as her brother Matt and sister Lesley continue to perform in her live band and her three children – Avery, Olivia and Audrey – were raised on the road, watching shows from the side stage. Sara has a new solo album is in the works for 2019 however she was inspired to go in the studio earlier this year with her own family, daughter Olivia Barker(16) and son Avery Barker (19), to record a small side-project after fan reaction to acoustic renditions of “Dreams” and “Born To Fly” posted to Instagram. The result: a 6-song EP — The Barker Family Band — and limited engagement acoustic tour — City Winery and SiriusXM Y2Kountry present Sara Evans and The Barker Family Band – Bloodline Tour —launching this spring. As Olivia, a powerhouse vocalist and songwriter, and Avery, a singer/songwriter, guitar player and multi-instrumentalist, embark on their own solo music careers, Evans is thrilled to share The Barker Family Band EP on April 12 as a snapshot of this moment in time for the family. Mesmerizing harmonies are showcased on covers including Beyonce’s “XO” and Fleetwood Mac’s “Dreams,” along with an original song, “The View,” written by Olivia and Avery. Sara and Olivia trade off lead vocals and harmonies while Avery played acoustic and electric guitar on the tracks. The project is co-produced by Sara and Ben Fowler. The trio will also embark on the 6-city limited engagement City Winery andSiriusXM Y2Kountry present Sara Evans and The Barker Family Band – Bloodline Tour in late spring, with tickets on-sale starting March 14 at SaraEvans.com. Country music icons Trace Adkins and Clint Black will make a triumphant return to the stage together as part of the Hits. Hats. History. Tour. Pre-sale tickets go on sale March 5, with all remaining tickets going on sale March 8 at 10 a.m. (local time). The Hits. Hats. History. Tour kicks off May 2 in Charlotte, North Carolina and travels to nine different cities through August 9, with additional dates announced in the coming weeks. This summer tour will get that much hotter via the addition of a series of special guest artists such as Terri Clark, John Berry and Craig Campbell. For more information and tour dates, visit clintblack.com. Clint Black Celebrates Milestone With The "Still... Killin' Time 30th Anniversary Tour"
Grant Landis Releases New Song "Home To Momma"
Multi-platinum entertainer Sara Evans has a trio of TV appearances set for this month as she rounds out the final five dates of her popular, limited-engagement “At Christmas Tour” running through December 15. On December 10, Sara joins Jake Owen, Travis Tritt and Shania Twain as a guest panelist on USA Network’s new country music showcase, “Real Country,” which broadcasts at 11pm eastern / 10pm central. She returns to guest cohost “The Talk” on December 11, joining hosts Sara Gilbert, Sharon Osbourne, Sheryl Underwood, and guest cohost Angie Martinez for the live talk show airing at 2pm eastern / 1pm central on CBS. After wrapping her “At Christmas Tour” mid-month, Sara joins Slacker Radio as featured host of their #WCECountry (Woman Crush Everyday) station. Visit https://www.slacker.com/station/wce-country beginning December 17 to hear more! Country icon and GRAMMY Award winner Clint Black is ringing in the holiday season with his trademarked Christmas cheer and a very special studio album. The Clint Black Christmas Collection, out today via Clint’s own Blacktop Records, features songs from his 1995 Christmas album Looking for Christmas, along with some new recordings written for his recently premiered holiday musical of the same name. 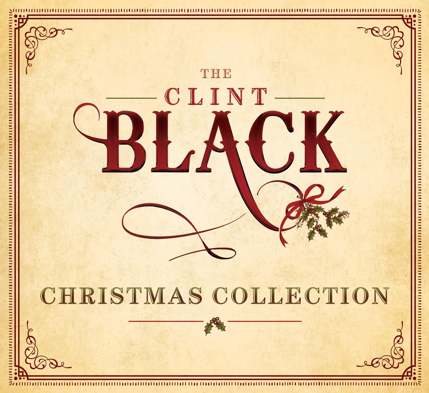 You can listen to The Clint Black Christmas Collection at the link provided HERE. Additionally, the album is available for purchase in various holiday bundles at www.clintblack.com. Keeping with the spirit of Christmas, this self-produced release is a family affair for Clint. His wife Lisa Hartman Black joins Clint for a beautiful rendition of his 1995 cut “The Finest Gift.” Lily Pearl Black makes a splash on her recording debut with the gorgeous “Magical Christmas,” one of her dad’s new songs on the album. Also appearing on this collection are classics like “Light the Fire” - written for the animated television series Transformers: Rescue Bots- and “The Kid,” which features a co-writing credit from the late great country music star Merle Haggard. Corey Smith Releases Music Video And Single For High Energy New Song "Honky Tonkin' In My Blood"
Georgia-based, singer/songwriter Corey Smith, known for his independent attitude and lyrical honesty (“Let Me Love You On a Back Road” and “I Love Everyone”), dives deep into his own psyche with the release of “Honky Tonkin’ in My Blood.” Out today, this third track from his forthcoming Great Wide Underground project reflects on how his relationship with his father helped to shape his Honky Tonkin’ nature. Like an answer to a question, “Honky Tonkin’ in My Blood” examines a life of sneaking into taverns and listening to living room jam sessions and considers how both experiences and genetics can mold not only a person’s life but the music s/he creates. Multi-platinum entertainer Sara Evans traveled to Los Angeles this week where she appeared on “The Talk” (CBS) as guest co-host earlier today. Sara joined hosts Sara Gilbert, Sharon Osbourne and Sheryl Underwood, along with guest co-host Dania Ramirez for the live talk show where they discussed current topics and interviewed the cast of The Conners. Sara was also surprised during the broadcast with a plaque for her R.I.A.A. GOLD certified album, Stronger, which includes the platinum-selling, two-week No. 1 single, “A Little Bit Stronger.” See the full show HERE and Sara’s Stronger surprise HERE﻿. Multi-platinum entertainer Sara Evans will guest co-host on “The Talk” next week, joining hosts Sara Gilbert, Sharon Osbourne, Sheryl Underwood, and Eve for the live talk show airing Tuesday, November 13 at 2pm ET/1pm CT on CBS. Multi-platinum entertainer Sara Evans is offering a vulnerable, acoustic performance for her haunting hit, “All The Love You Left Me.” Following her headlining run on CMT’s Next Women of Country Tour earlier this year, the “artist in full musical flight” (Associated Press) visited CMT’s 330 Studios in Nashville to film a live performance music video with her band, including siblings Matt Evans and Lesley Evans Lyons and son, Avery. The clip will debut Monday, October 22 as part of digital music series “CMT Next Women of Country Live 2018 on CMT.com. In addition, an acoustic version of the song is available now at saraevans.co/ATLYLMa. Originally released on her recent album Words, the song has been spinning on Sirius XM’s Y2Kountry since February. While the song written by Ben West, Hillary Lindsey and Gordie Sampson, implies an abandoned love, Sara was compelled to sing it for a friend at home in Birmingham, Alabama who had recently lost their child to cancer. As Sara’s eight album catalog crosses the 100 million stream mark on Spotify, Sirius XM has started spinning “Long Way Down,” also found on her album Words, on Y2Kountry (Channel 61). And starting next month, she’ll return for another holiday season of her popular, limited engagement At Christmas Tour, kicking off November 24 in Cincinnati, Ohio.